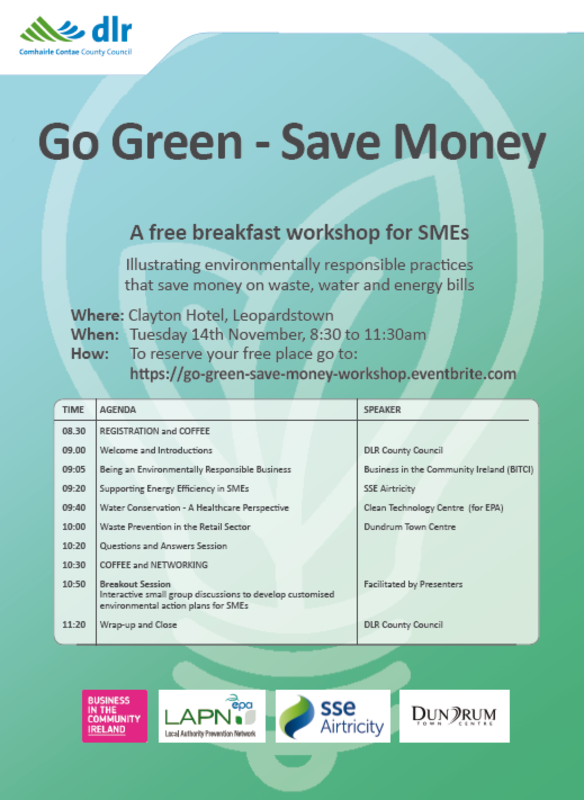 Dún Laoghaire-Rathdown County Council are hosting a morning interactive workshop to support Small to Medium Enterprises (SMEs) in the Dún Laoghaire-Rathdown area to implement environmental best practices and save money on their water, waste and energy bills. Practical examples of how to be energy efficient, conserve water and prevent waste and the associated cost savings. Details on what it means to be a responsible business and the bottom line benefits. Information on using a free on-line tool to learn how resource efficient your business is. Facilitation to develop an environmental action plan customised for each SME attending. Registration from 8:30am – event kicks off at 9am and finishes at 11:30am. Free parking in the Clayton Hotel for event attendees.